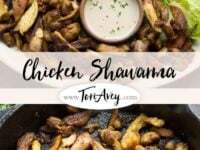 Chicken Shawarma Recipe – Recipe & Video. How to make homemade Middle Eastern shawarma in the oven or on the grill. Simple marinade and cooking technique. Step-by-step video below! Homemade Chicken Shawarma?? Yeah, I went there. You know I wouldn’t post a recipe that I don’t love. Well, I’m in love this recipe. I’ve cracked the homemade shawarma code. And it’s awesome. Seriously awesome. Okay, so technically this recipe should actually be called Shawarma-Style Chicken. True shawarma is cooked with stacked, spice-marinated meats– lamb, turkey, chicken, beef, or a mix of meats– on a vertical spit. The shawarma turns and cooks on the spit for hours and hours, basted in fat and its own juices. Fat = flavor = tasty, amazing shawarma. Thin slices of meat are shaved from the surface and served, either on their own or tucked inside a warm flatbread, topped with tahini or garlic sauce. Shawarma is one of life’s great pleasures. I’ve been trying to replicate the flavor of shawarma at home for months, playing with different spice combinations and cooking methods. At first I tried buying premade shawarma spice blends from the Middle Eastern markets, but none of them made my mouth happy. I needed more spice, more flavor, more oomph. So I began to experiment. Then finally, last week, I nailed it. This recipe is probably as close as I’ll ever come to making shawarma at home. My husband says it’s even better than the shawarma at our local Lebanese restaurant. He’s biased, of course– but he’s also brutally honest, especially when it comes to my recipes. I blind taste tested two of our Israeli friends, and they both asked me if I’d finally gotten that shawarma spit I’ve always wanted (in my dreams!). Suffice it to say, I’m happy with the result. You have two choices for cooking this recipe– in the oven or on the grill. To be honest both cooking methods taste great, there really isn’t a big difference between the two. 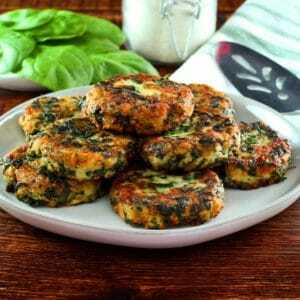 I use boneless skinless chicken meat (a combination of dark and light meat) in the recipe. Shawarma gets a lot of its flavor from the meat fat that it is basted in. I’ve replaced the flavor of the skin fat with olive oil, including a final saute in olive oil prior to serving. It may seem strange to saute meat that has already been cooked, but you’re going to have to trust me on this one. 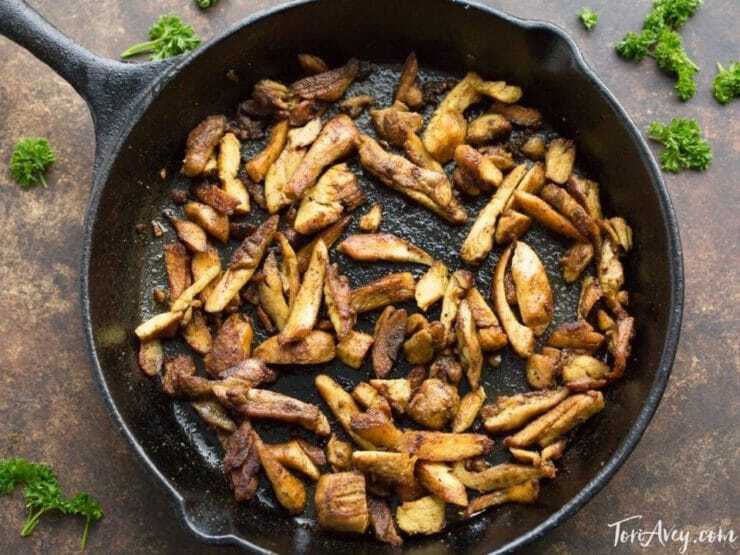 The extra saute adds a ton of flavor and really gives it a shawarma-like texture that can’t be replicated in the oven or on the grill. If you’re trying to cut down on your oil intake you don’t need to do the extra saute, it will save you 2 tablespoons of olive oil… it won’t taste exactly like shawarma, but it will be yummy. But please, don’t replace the chicken thighs with breast meat. This dish really needs some dark meat in it to make it taste great. You can make it with all chicken thighs, if you prefer (I actually love it that way), but don’t sub all chicken breast. Pretty please. 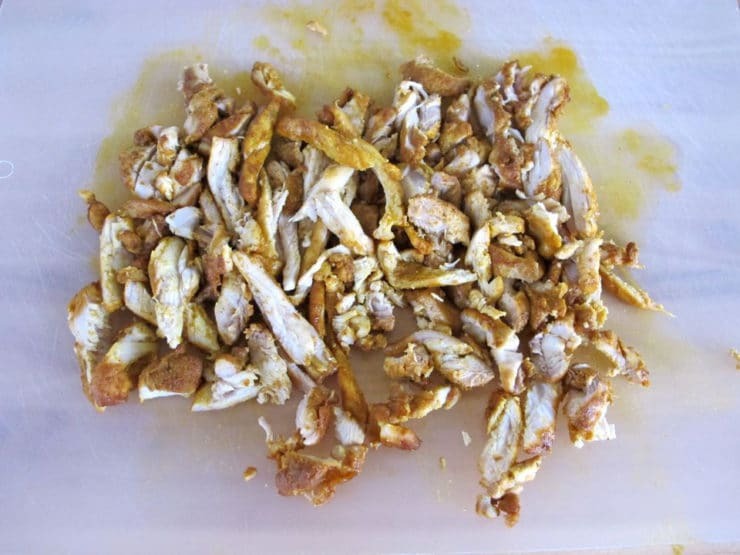 How to make homemade chicken shawarma in the oven or on the grill. Grill or baking sheet, tongs, skillet, spatula, plastic wrap. Slice the chicken breasts into 5-6 pieces each and the thighs into 3-4 pieces each. Place them in a marinating dish or large plastic zipper bag. In a small bowl, whisk together 1/4 cup olive oil, the spices, 3/4 tsp salt and 1/4 tsp black pepper (if you are salt sensitive, use 1/2 tsp of salt). Pour the spice marinade over the chicken pieces. Stir with a spoon till all the chicken pieces are evenly coated in the marinade. Cover the marinating dish with plastic wrap, or close the zipper bag. 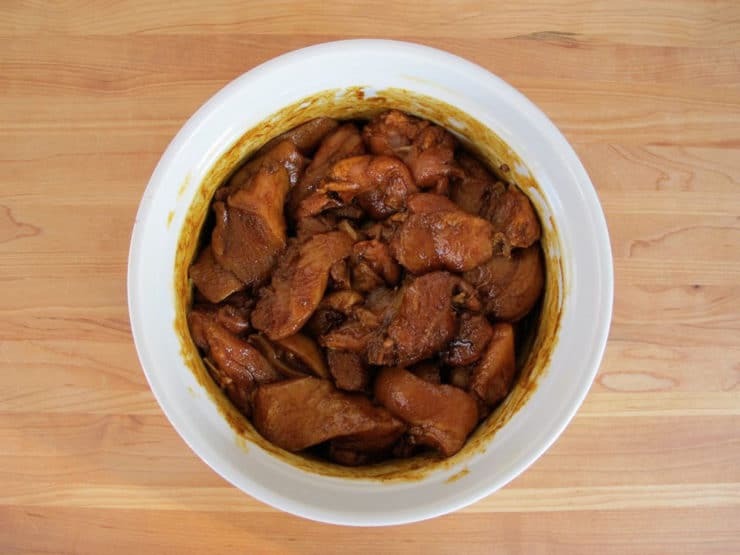 Place chicken in the refrigerator and let it marinate at least 1 hour, up to overnight. 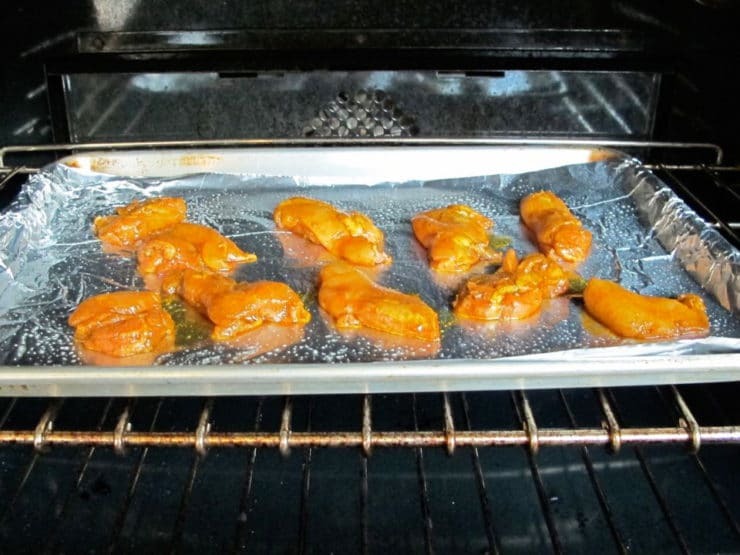 Preheat oven to 400 degrees F. Spray the baking sheet with nonstick cooking oil. 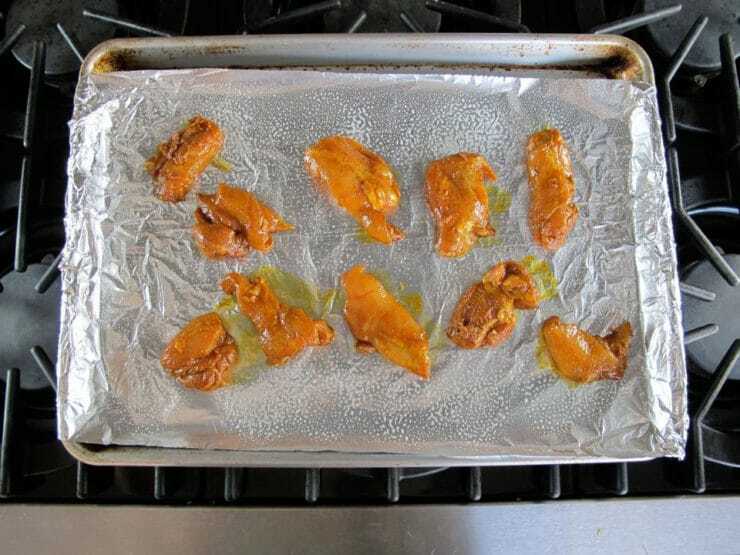 Place the chicken pieces on the sheet, evenly spaced. Place the chicken in the oven. Let it roast for about 15 minutes until cooked through, turning the chicken pieces once with tongs halfway through cooking. Take chicken out of the oven and let it cool slightly. 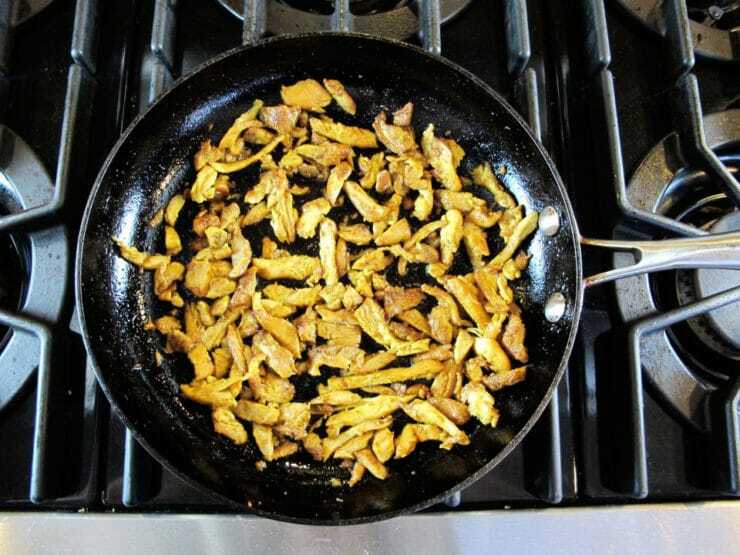 Use a sharp knife to slice the meat into small, thin shawarma-like pieces. Heat 1 tbsp of oil in a skillet on the stovetop over medium. Pour half of the chicken into the skillet and saute for 3-4 minutes till the smallest pieces of chicken turn brown and crisp. Season with additional salt and pepper to taste, if desired. Spray the grill with nonstick cooking oil and preheat to medium heat. 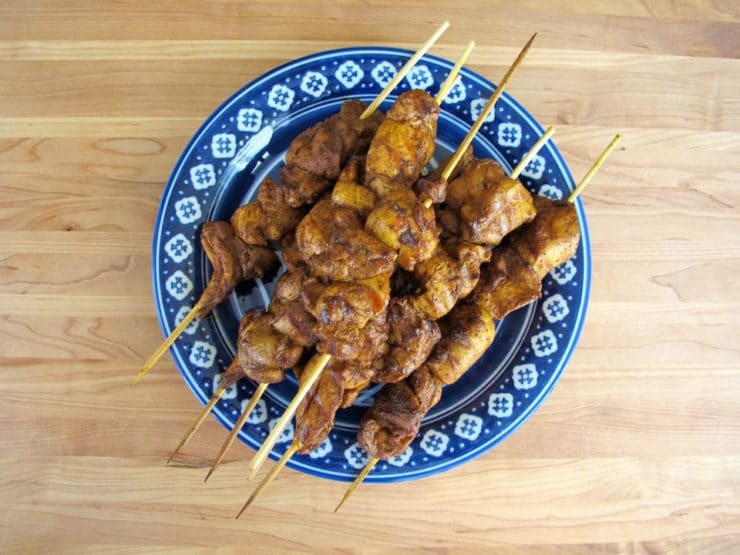 Thread the marinated chicken pieces onto wooden skewers. Cook the chicken for about 20 minutes, giving a quarter turn every 5 minutes, until cooked through (slice into the thickest piece of meat to check for doneness). Let the chicken cool slightly, then remove it from the skewers. 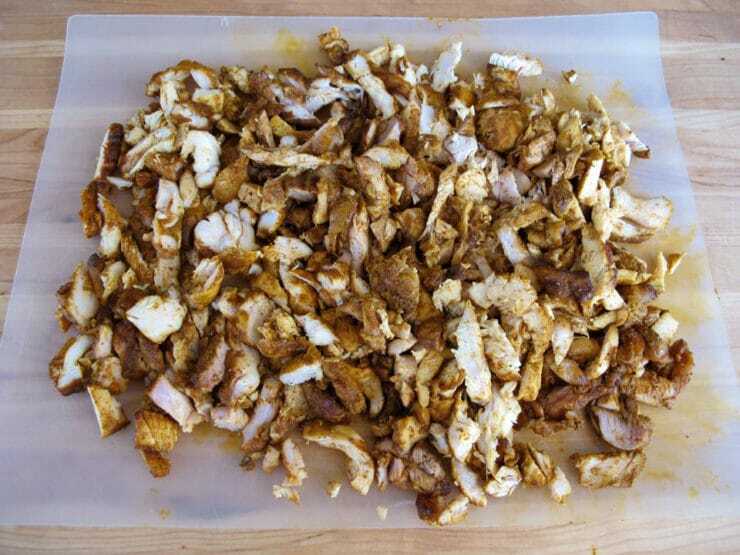 Use a sharp knife to slice the meat into small, thin shawarma-like pieces. Heat 1 tbsp of oil in a skillet on the stovetop over medium. Pour half of the chicken into the skillet and saute for 3-4 minutes till the smallest pieces of chicken turn brown and crisp. Season with additional salt and pepper to taste, if desired. Remove the cooked chicken from the skillet. Heat another 1 tbsp of oil and saute the remaining chicken in the same way. Serve warm. This is the best shawarma I’ve ever made!! I add a quartered onion to the marinade and a Tbsp of salt and I marinade up to 3 days at least one, It’s so good! The first time I made this recipe I found the flavor to be subtle and bland so the second time I made it I doubled all the spice quantities and thought it was incredible! I also used chicken schmaltz (rendered chicken fat) when I fried it up in the frying pan. Great! It’s so easy to make at home now. Thanks! AMAZING!!!! “Better than” our go-to shawarma place! Rave reviews from everyone who tried it! Thanks for sharing!! Excellent and easy. Not a fan of Tahini so served it with salad (lettuce/tomato/cucumber/spinach), pita bread warmed in the oven after I took out the meat and turned it off, Humus and Tzatziki Sauce. Also ended up sauteing a little longer than called for. Thank you. Thank you for recipe that a simple mind like mine can understand. I do have a question what kind of white sauce is that in that presentation? Hi Bobby– it is toum sauce. This recipe was delicious. My husband loved it. Super easy recipe with very simple instructions and the meal turned out great. Very good recipe. Have made it many times and it’s always delicious. Thanks for sharing it! You’re welcome Jonathan! Thank you for writing. I would like to know what dressing you used on the lovely salad that shares this plate of Shawarma. We just experienced Shawarma last night at a Mediterranean restuarant and loved it. Can’t wait to try your recipe. Several of us living here in Idaho are homesick for the variety of cuisine in big cities, so I made the grilled version of this recipe for a dinner party. It was a huge hit. We swapped stories about Shawarma stands in NYC & Seattle. I’ve been using this recipe for years and I love it! I had been using an old printed version, but lost it in a move. I’m glad that I lost it so that I could find your new website, and all the new wonderful recipes! Glad to have you back Bridget! Hi Tori! I love this recipe have made it often! Thank you! Would I be able to make this with lamb? Would I need to adjust the oven time? Would I need to adjust the spices at all? 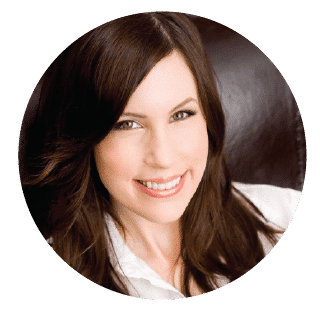 Hi Karolin, Tori’s assistant Ashley here. You can certainly use this spice blend to make lamb shawarma, however we haven’t texted the recipe using lamb so I can’t advise on cook times and oven temp. My husband and I love this recipe! He asks for it just about every week since i found it! 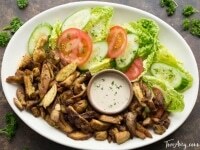 Do you have a Beef Shawarma recipe as well or would this recipe work well with beef too? I woudl be interested in knowing which cut of beef to use …maybe a skirt steak ? This is the best recipe ever!!!!! Wow. Simply amazingly. Perfect taste and easy to make. Followed the recipe as is. Thanks!! This is a keeper! It was so good, even my three-year-old gobbled it up and stole some pieces from my husband’s plate! We all had seconds. I was going to skip the cook-again-in-the-cast-iron-pan part but I’m so glad I didn’t- that made the dish! Very good! I made it exactly as directed and it was great! Thanks Melissa, I am working on fixing this issue right now. Printing worked fine for me! I made this tonight for the first time and it’s so easy and delicious. Hi William, the print feature seems to be working fine. Can you tell me what browser you are using? I am unable to print as well. Using Chrome. Receive an error stating Access Denied. My sister swears by your recipe. Has our mother preparing and now I am going to try. Would have been nice to print. about to try this recipe and really excited! looking at the nutrition facts. how is this only 1gram of protein? it’s pure chicken so that doesn’t seem to make sense. can you please clarify further? thank you! Amanda thank you for pointing that out! I recently installed a new software to help me calculate the nutrition, but it appears it was not working properly. I just found another calculator that is more reliable, the nutrition above should be more accurate. Awesome and easy recipe. Thank you so much. Iv’e made it a few times and my family loves it. My wife, kids, and I loved this. I grilled the chicken, sliced it and added it to pitas with tzatziki, cucumbers, tomatoes, and lettuce. After 90 minutes of marinating, it had plenty of flavor. Wow, my son and daughter in law took me out to a restaurant in the Bay Area where I had a delicious shawarma dish. A few days later, I found your recipe and tried it out…OMG! I loved it! We have made it a few times and my favorite is with hummus, grilled onion, tomatoes, on pita or naan. My family also adds tahini and/or sriracha. It’s definitely a new favorite! Just awesome! I cooked the chicken in a grill basket on the BBQ, and just shredded it once done and crisped it up in the basket – saves a step and keeps that fire-cooked taste. I’ve made this twice now. It’s delicious!!!! Thank you for a simple, delicious dish. I followed the recipe and at the last minute added a dollop of Greek yogurt to the marinating chicken. Came out amazing. Thanks!! Excellent! We keep frozen boneless thighs in the freezer. They thaw in about three hours. An hour in the easy marinade, a half recipe roasted quickly in the toaster oven on a parchment-covered sheet pan, then lightly fried in oil, and this dish was full of flavor. We devoured it with onion and mushroom rice. Thank you for simplifying a favorite restaurant meal. Would smoked paprika really ruin the flavour profile? It won’t ruin the dish – but it will be different, you will lose the balance of the cinnamon flavor which is key here. In other words, it won’t taste quite as shawarma-like… but it will still be tasty. I made this with homemade pitas. I let it marinate for 1 hour and used the stovetop method to cook it. It turned out divine. We stuffed it inside our pitas with hummus, aioli, and some spicy mustard. A new favorite…so much better than Naf Naf grill! Do you think I could cook the chicken in the oven in the morning and then sauté it later in the evening? Thinking of making this for a party so want to get as much of the prep out of the way as possible. Thanks!! 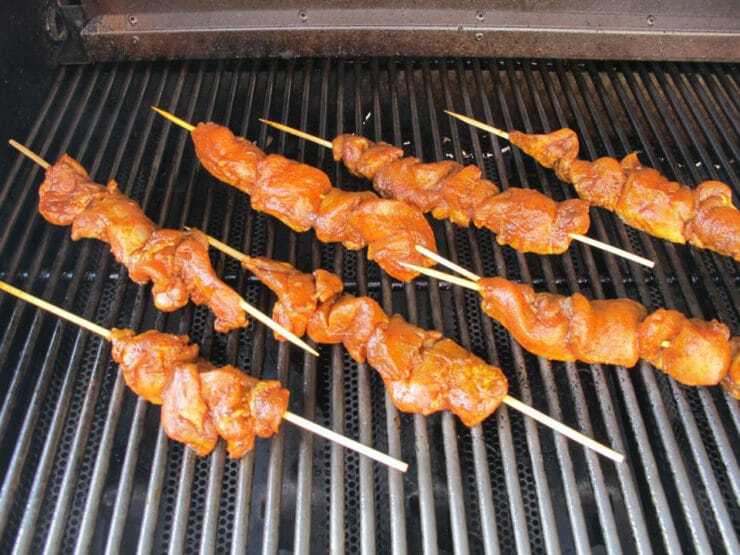 Why can’t the marinated chicken piece be skewered firmly onto a showtime rotisserie rod to try to replicate the vertical heat rotisserie? Fabulous recipe! Easy to make and completely nailed the taste. The family loved it; thank you! This recipe is amazing. Thank you so much for sharing with us . But I have one question can I use chicken thighs with bones in it or not. Hi John, Tori’s assistant Ashley here. You would need to take the meat off of the bones before preparing. We were in Israel last week and I posted many pictures of the most amazing Shawarma EVER! I had to promise friend I would make some when I returned home. This recipe is going to be perfect I think. Now to find recipes for the amazing salads and it’s party time! So I decided this going to be the star player for my son’s high school graduation party. After multiplying the recipe by 27(! ), I baked and fried 166 chicken thighs. Everyone raved. Served it with fresh pita, saffron rice, toum, and a red cabbage/feta/date salad. Huge success. Thank you so much! You are an amazing person!!! What a great way to test a recipe 🙂 nice effort. I made this yesterday for my Egyptian husband – he loved it! It is so easy to make, and tastes so authentic and delicious. We had it in a wrap, with Lebanese aioli, pickles and fries, as is how they do it in Alexandria. I think it will become a regular in our household! Thank you for sharing! I just made Chicken Shawarma, and I followed your recipe, and the outcome was simply amazing. It was delicious, liked by everyone in the family. It felt great, the taste, the texture was perfect. Thanks for sharing this recipe. I am totally in love with this recipe. It quickly became one of the favorite things that I make, and I’m a food snoot. The recipe is perfect as it is. Don’t mess with it. I eat it in a pita with a yogurt tahini dressing and a tomato cucumber and onion salad or sometimes use the chicken itself for chicken salad. It’s delicious either way. Thank you thank you!! You definitely cracked the shwarma code. Okay, since shawarma is actually kind of a wrap, I made chicken by the recipe (which tasted quite good by itself), then wrapped it into lavash together with sliced tomatoes, cucumbers and several big leaves of lettuce, added garlic sauce, and ate it. I loved it, as did my SO. Will definitely do that again. Great recipe! Fun to also experiment with variations too! This was awesome. Tori was right in describing many of the ways homemade shawarma falls short so I thought she was on to something and gave it a try. The recipe was so easy and amazing. I’m a sharawarma addict when I’m in the Middle East and am so glad I can come close to replicating that at home. I just made this recipe for a Mediterranean themed baby shower that I hosted. This was amazing (and easy!). My guest raved and for sure we’ll all be making it again! Love, love, loved this! Thank you! I’ve used this recipe several times, and each time has been delicious. I live in Toronto, where we have a significant population of immigrants from the Levant. There is shawarma everywhere here, with variations based on the actual origin countries. This recipe produces results similar to my favorite Lebanese joint. Love it!!!! I have very little cooking experience, but I was easily able to make this dish. This is delicious. It was fantastic when I tried it at home myself. My family ? really enjoyed it. They all asked for more. I have made a lot of online recipes, but this is the very first I’ve reviewed. I felt compelled to, the dish was just so amazing! The flavours, the textures, I would not change a thing! Thank you thank you, for sharing this! I used this recipe on turkey legs. It was a hit. Next time I plan to use on grilled meat. Can’t wait to use this again. I just cooked this tonight. I marinated the chicken for 6 hours, then grilled it on bamboo skewers, and it turned out great. This is a wonderful and easy recipe. This is my go-to shawarma recipe. 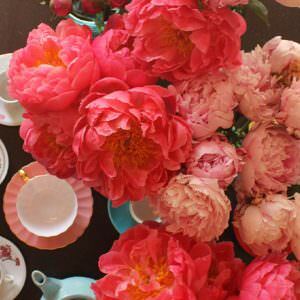 I have served this for many special dinners/gatherings and it’s always delicious. I typically don’t do the last step of refrying things, but just the spice mixture is fabulous and keeps me coming back. I usually do this plus lamb kofta from the allrecipes website and make some delicious middle eastern sides and it’s a wonderful feast with bright vibrant flavors. this made quite a bit for a family of 2, so there were a lot of leftovers, but the flavor was perfect, and it held well. i usually don’t like leftovers of any kind (and especially not chicken), but i ate this until it was gone! and i found myself craving it for days. Hi Pete – the flavor will be different if you omit the paprika, but it should still be quite tasty. I don’t have a sub for the paprika, unfortunately. I have made this almost twenty times now. I have gotten nothing but compliments about how good it is. I actually think its pretty spot on for a new favorite dish I never get tired of. Yummy yummy…. Cant wait to try. Especially since I have all of the ingredients in my pantry. Cool!! 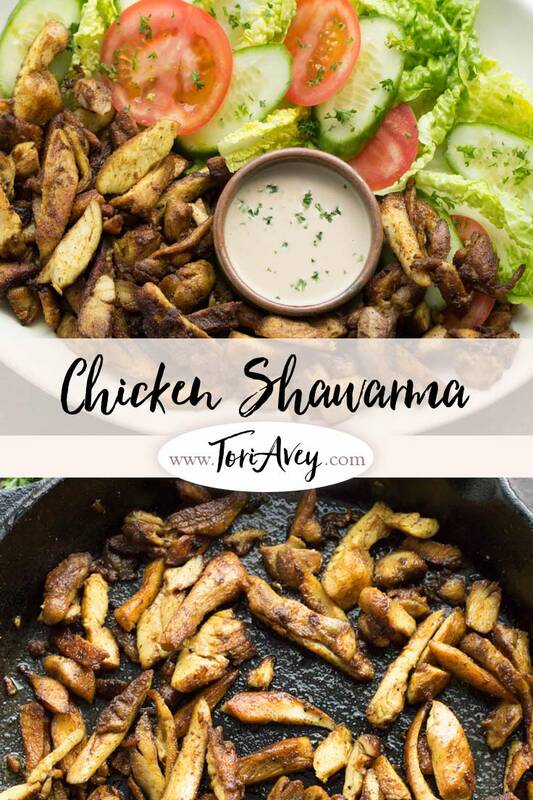 It is 600 here and I’ve been up since 545 making your shawarma for my son to take to work…we all love it…It’s marinated overnight…what’s a mom to do..lol…the perfect shawarma recipe! Who would have thought that it was possible to make shawarma at home ??? I came across your site while searching for this recipe. It turned out excellent. We love middle eastern Sephardic food and this site has given me a whole lot of arsenal for cooking. No more take aways… Kitchen here I come. Thanks a lot Mrs Tory Avey. I buy chicken shawarma at local takeaway and this taste nothing like it. This smelt good but In fact it was quite bland . I followed exact instructions and weighed ingredients. Big thumbs down. Sorry to hear that John. Many people love this recipe, but it can’t be to everyone’s taste. Better luck next time! I’m sure this is true but this is nothing like shawarma . You have certainly invented a new taste though. Just FYI I live in biggest Jewish, Muslim settle in U.K. We have access to traditional food 24/7 but pay high takeaway prices. I wanted to make it on the cheap myself . Keep experimenting tori . If I find real traditional recipie I will mail it too you? I’m trying it today, although I’m not going to post skillet cook it, hope it’s close to my favorite dish from our kabob house restaurant… I’ll post again after dinner! ? Great cooking method! Thank you. Brought me back to street vendors in NYC! I altered the spice b/c of what I had around: green onions sliced, fresh garlic crushed, turmeric, cumin, cinnamon, paprika, salt, pepper, nutmeg, olive oil, served over brown rice with veg, drizzled with my fav. sauce options: bbq, hot, and lemon tahini with garlic sauces! NOM! this is the best. we love getting take out shawarma and this is just as good or better! thank you for spending the time to crack the code. my son, who is very picky, loved it so much! i just can’t say enough good things about this recipe. YUUUUMMMMMM! Can’t wait to try another of your recipes. Congratulations! You nailed this! I had my first shawarma in Jerusalem last November and I’ve been wanting it again ever since. Really good substitution for the slow roast. Very good, extra yummy. Need to put vinegar in the marinade though. Serve with sliced red onions chopped parsley, summack lemon juice, salt and pepper- mixed together at least 2 hours before serving. I made a slight change over here as I added 1 teaspoon dried oregano, 20g of ½ teaspoon ground cloves and 1 cup cheddar cheese to add its taste. I need to say that it’s one of the tastiest dishes which I have tried till now. I tried your mushroom garlic soup for the first time, and my son Ryan loved it, we liked your panko recipe too. I shared this website with my colleague Kately, who just enjoys trying out recipes with Levantine dishes. This has become a go to recipe for me. I make it as is and love it! My oldest son asked for this recipe after I made it for him. I did tofu in the marinade and cooked it in the frying pan for my vegetarian middle son. My youngest fussy son ate it right up. It is the new family favourite! and will be using it again. Thanks so much for the recipe -it was simple but still delivered. 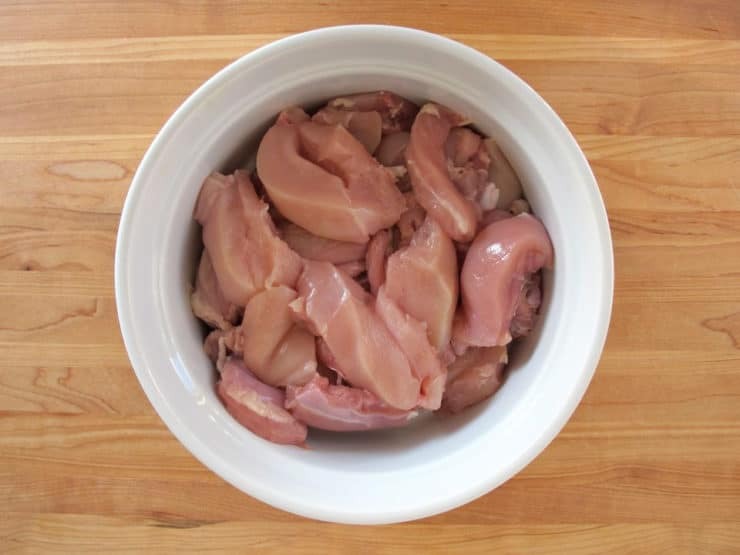 Ever tried freezing marinated uncooked chicken? Make this recipe for the last 5 years but never tried freezing it after marinating. Your thoughts? You can prepare the chicken and marinade place in a zip lock bag make sure you remove as much air as possible. Place it right into the freezer. When ready to use let it defrost in refrigerator. It will be great. It’s definitely a new regular in our home!